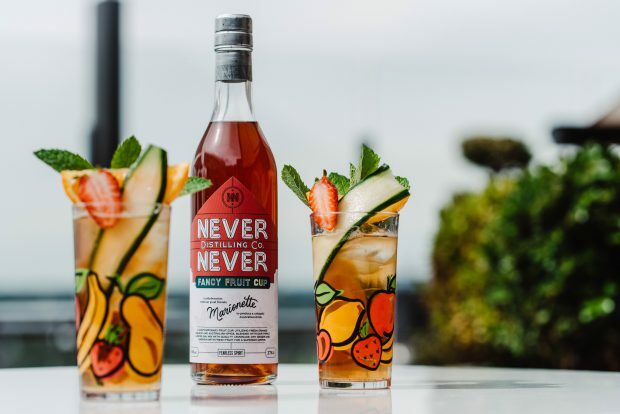 Adelaide’s Never Never Distilling Co. and Melbourne’s Marionette Liqueur have joined forces to produce a contemporary version of the fruit cup to celebrate the Australian summer. The ‘Fancy Fruit Cup’ combines Never Never’s award-winning Triple Juniper Gin with Marionette’s barrel-aged Orange Curaçao, Australian and international spices, and Earl Grey tea for a uniquely Australian aperitif. Steeped in English history – and enjoyed at typically English events like Wimbledon and The Ashes – the fruit cup is a gin-based drink that is served long, topped with lemonade and ginger ale, and garnished with a bouquet of fresh fruit. Pimm’s is the most famous example. The Fancy Fruit Cup pays homage to this tradition while highlighting uniquely Australian fruit and botanicals, and is described as a “more modern, complex and luxurious beverage”. “The fruit cup usually welcomes the beginning of the English summer,” says Sean Baxter, Never Never Brand Director. “With Australia having an undoubtedly superior summer, we thought it was about time to develop our own expression. Nick Tesar, founder of Marionette, is also excited about the partnership. “For us the prospect of working with Never Never is very exciting, they are a young passionate group, at a similar stage of their journey to us,” he says. The Fancy Fruit Cup (27% ABV) launched on December 1 and will no doubt feature at rooftop bars around the country. Method: Add all ingredients to a wine glass and top with ice. Garnish with cucumber, strawberry, an orange slice and mint. Serve immediately.